Whenever I see a European (or any fair-skinned – hoping to not sound racist!) lady draped in a saree, I always get amused by the paradigm shift of the cultural worlds from west to east. I see more and more Indian ladies reaching out to the ZARA's and CALVIN KLEIN's of the world; while many westerners are busy learning to drape sarees. So when I read about the sad demise of the Iron lady of India, who reportedly owned around 10,000 sarees, I couldn’t resist reminiscing about this significant aspect of her life which distinguished her from her other counterparts. Jayalalitha or “Amma” as she was known lovingly known was as famous for her beautiful collection of sarees as much as her oratory skills in the Parliament. 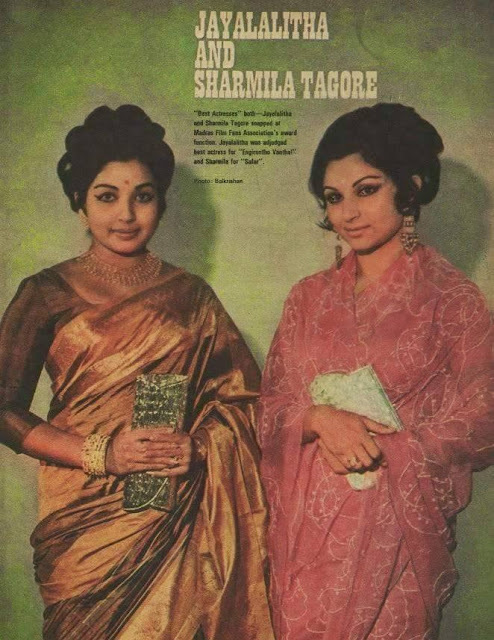 She managed to carry the simplest of sarees with an amazing grace and magnificence. Maybe it was the erstwhile actress in her or maybe just her signature fashion sense, but she always managed to grace any event, may it be meeting Bill Gates or Mother Teresa, with the same quiet dignity and “Indianness”, which is unfortunately fading away in the next generation. So let me a quick homage to Amma, in So-Saree style.